I took a break from the books to get some deliciously authentic Thai food from Noi herself. Stop by her kitchen in Baywood and enjoy the flavorful dishes (I also recommend the $1 egg rolls) and imported Thai decor. It’s an approach that may seem obvious when it comes to art, but the simple phrase is a meaningful one for Jeff Claassen. 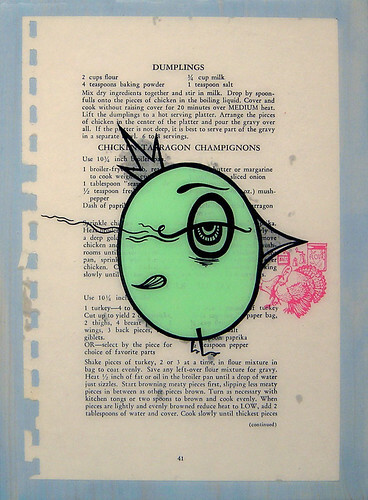 If you take a look through his “stuff” you’ll understand how those three words have influenced the unique, self-sufficient style and impromptu creative process behind his whimsical world of bright paint, bold lines and sleepy eyes. Claassen’s a Central Coast native. He flew South to get a taste of Los Angeles living, but returned after almost a half-decade when the opportunity arose to be close to his family members who were slowly reuniting in San Luis. 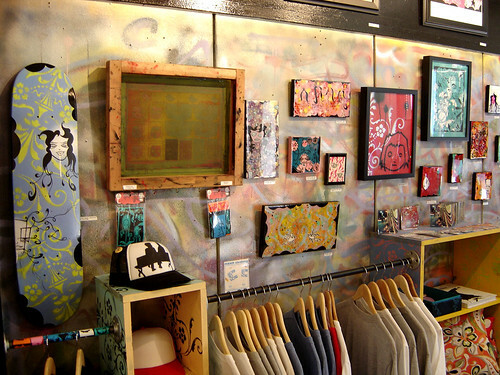 He came back with the desire to establish a gallery space of his own, and in 2004 he opened his first location in downtown SLO. The store has since been relocated to a new spot on Marsh Street – the brightly colored window display pops from the drab brick building. His father is the inspiration behind the D.I.Y. attitude. The “super handy man” has always completed his own projects, from oil changes to furniture assembly, and it rubbed off on his son. 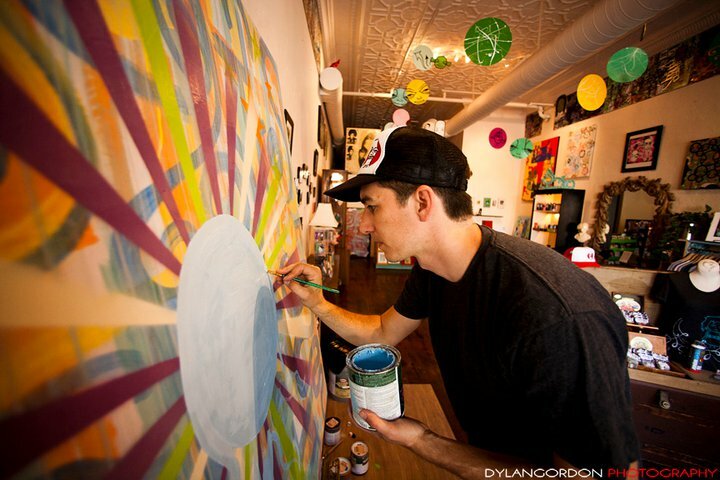 In the same manner, Claassen stretches his own canvas and makes things like pins and magnets in the shop. 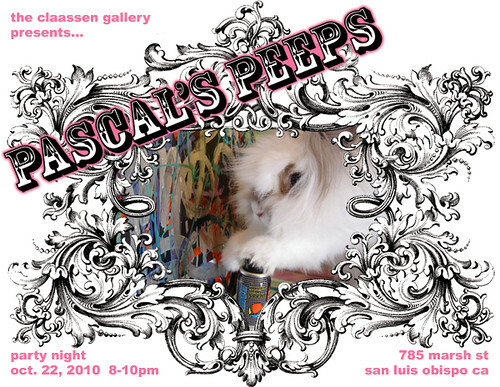 Doors are always open during shop hours and visitors are welcome to come in for a chat or say hello to Claassen’s bunny friend, Pascal, who recently hosted an in-store show featuring 45 other local artists. Claassen recently hosted a 3 week long show featuring 45 artists. 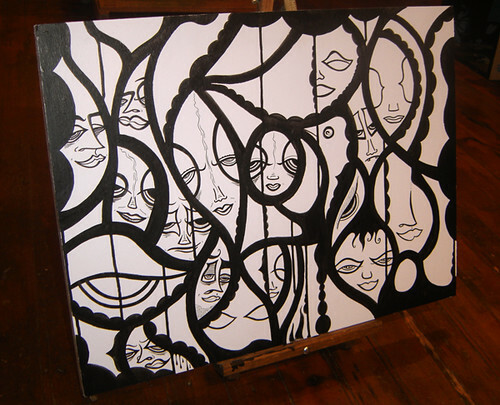 Claassen pieces are a hot commodity in SLO and can be found on the walls of downtown establishments such as Chino’s Rock & Tacos and Kreuzberg Book Bar & Coffee Lounge. Another Central Coast photographer, Henry Bruington, has known and admired Claassen since he “stumbed upon his art gallery” in the 7th grade. He’s bought so much “stuff” that he’s lost count of the pieces, calling Claassen the “Godfather” of the San Luis art scene. The originals sell for about $250-$350, and the pricing is based on size. Luckily for most of us, especially students, Claassen makes limited edition prints on pine. 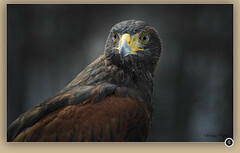 You can view or purchase the available art and other awesome stuff in the store or at his on-line store hosted by Etsy. Looking for a cup o’ joe in SLO town? Sick of your usual Peet’s or Starbuck’s? 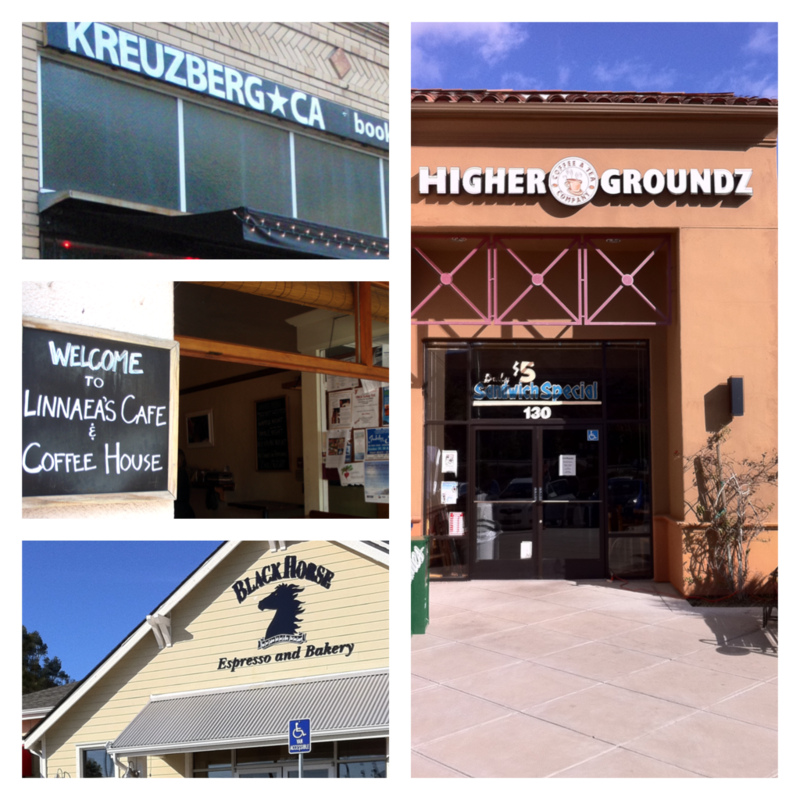 When corporate coffee gets old, try one of SLO’s local shops. Those featured on the map below epitomize a cool coffee shop culture unique to San Luis Obispo. The best offer bold roasts, tasty treats, mellow tunes, local art, and a calm, comfortable setting perfect for enjoying good drinks and good conversation. A recent addition to the Foothill Plaza Shopping Center has triggered a lingering buzz among the locals. It’s not surprising – the residents of SLO have been experiencing an unfortunate long-term doughnut drought and relief has finally arrived. For years there was only one destination for donuts in San Luis Obispo. The small shop, Sunshine Donuts, mimics the traditional set-up, drab décor, and in-and-out feel of most stores. Students living near campus had to drive at least ten minutes for a doughnut, and the glazed twist I got at Sunshine two years ago didn’t inspire me to go back. Thankfully, Jake and Jesse Pickering have come to the rescue. 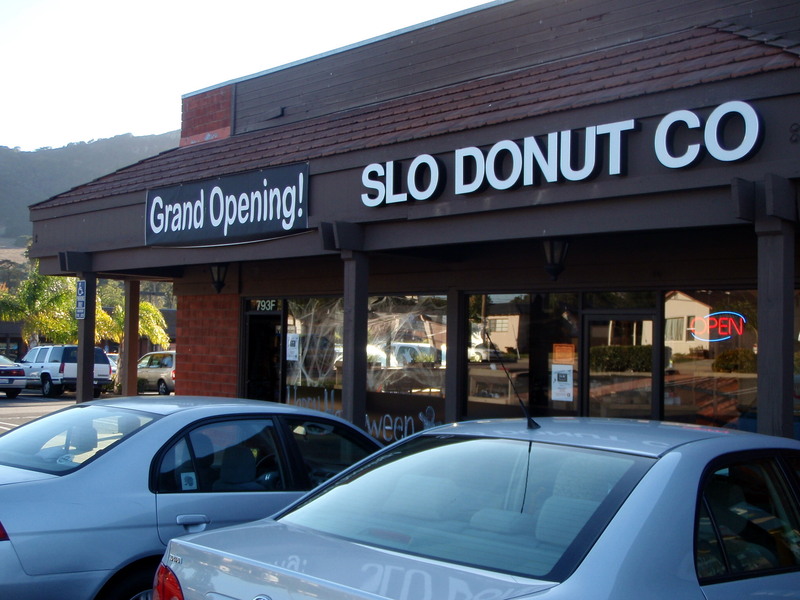 At 4 a.m. on September 30, they officially opened the doors of SLO Donut Company to the public. Jesse comes from a family versed in the doughnut business and the couple’s fresh take on the “old school” concept has more than filled the void for those just looking to grab a good doughnut. Delicious product, modern design, and a few innovative modifications have made the new shop a neighborhood hot spot. There are plans in the works for a pajama clad game night for students and live music and other family events on the weekends. A feature I’ve never seen in a doughnut shop – the D.I.Y. toppings center. Here customers can create their own doughnuts by adding icing, syrup, and sprinkles. Jake recently started posting mini-contests on Facebook offering a free doughnut of choice to the winner. The contests are revealed in SLO Donut Company’s status updates but be ready to compete if you want to participate. A couple groups of starving college students have already become devoted competitors. Maria Rivera has been working at the shop since opening and she told me about their book exchange program. The store’s back wall is lined with shelves of books that are available for trade. There’s no check-out system, management just asks that a book is left when one is taken. 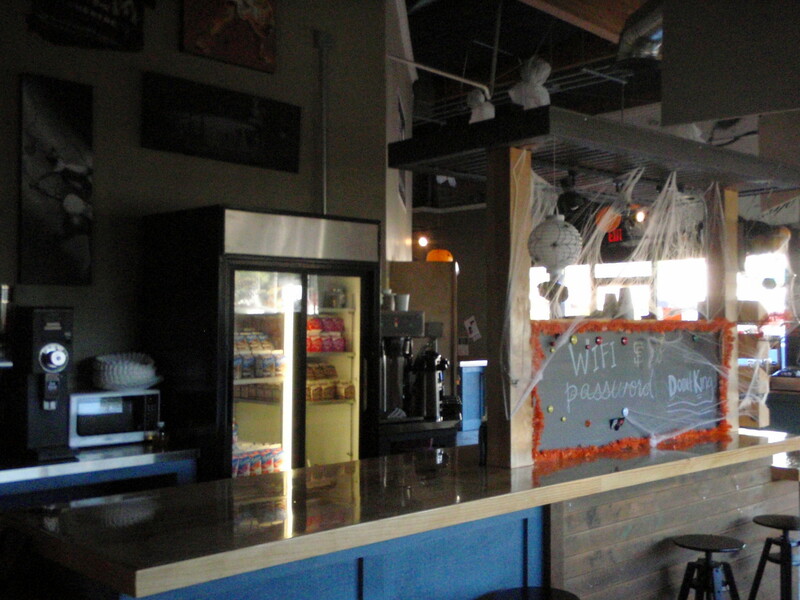 Also: board games, chalk boards, electrical outlets, and COFFEE. Business or pleasure, they’ve got you covered. You want to see a movie. You go to www.Fandango.com or check the local paper for show times and new releases. You decide to go to the Fremont to see the latest, over-done romantic comedy. Chances are you spend upwards of 10 bucks and walk away wishing you would have just waited to rent it or see it for free On Demand. You want to see a movie. But you want to try something different. You go to www.thepalmtheatre.com and find a selection of independent and foreign films that you probably haven’t heard of and that you can’t see at any of the other theaters in SLO. You decide to go to the Palm and see the latest from Woody Allen. Chances are you spend 8 bucks, or less, and walk away feeling a little more artistically and culturally enlightened – or at least appreciative of an out of the ordinary cinematic experience. We’ve all gone with Scenario A. I urge you to go with Scenario B (especially if it’s Monday). The Palm is San Luis Obispo’s only locally owned movie theater, and it’s as unique and obscure as the films that it features. Dee attends the Toronto Film Festival every year to hand-pick the movies that will be shown on the Palm’s trio of silver screens. He must have a good eye – according to seasoned manager Meghan Higdon, MTV icons Juno and Napoleon Dynamite made their debut at The Palm far before they became box office hits. Each title’s shelf life depends on attendance and popularity so it isn’t easy to predict how long it will be before a film is swapped out. The award-winning French film, Amelie, held a spot for over year. The Palm also hosts the annual San Luis Obispo International Film Festival, usually held in spring. Paris, Je T’aime, Into the Wild, and Slumdog Millionaire are a few of the titles I’ve seen, and loved, at The Palm. I recommend going on a Monday night because tickets are reduced to a special price of five dollars. I was lucky enough to get a special behind the scenes look at the finale of Paso Robles’ Fall Fashion Series. The event took place this past Friday in the ballroom at the Paso Robles Inn and featured Scissor Clothing, the brainchild of Central Coast designer Kate White, as well as a collection of ensembles from Velvet Boutique.